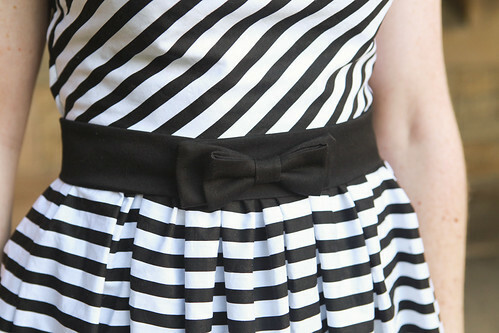 As promised, I’ve written a detailed tutorial on how to make your very own bow belt on my blog like the one I made for my striped dress. Bow belts are so easy to make and can add that pretty little detail to any outfit to finish it off. They are also great for using those scraps of left over fabric you have that you aren’t quite sure what to do with. There are endless options for customising your belt as well. You don’t have to make the belt from one single fabric – mix it up and have a different coloured bow and belt, or a different textured knot on the bow. You can also just make the bow part of this tutorial and use it as a decorative feature on any number of projects from head bands, pillows and cushions, hair pieces, shoe clips…the list is never ending. If any of you make one, I’d love to see them! This is very pretty, and it is on my “to make” list. Thanks for the tut! So sweet! It really makes that beautiful, striped dress. You did an incredible job on both.